PORT LOUIS, Jun 25 2013 (IPS) - “No fighting, please. Everybody will get their fish. Give us time to empty the crates and weigh today’s catch,” Patrick Guiliano Marie, leader of the St. Pierre Fish Multi-Purpose Cooperative Society, shouts at the crowd jostling impatiently at the fish landing station in Grand Gaube, a fishing village in northern Mauritius. People bump into each other to buy the fish that this cooperative society has just harvested from cages out in the lagoon. “We don’t get fresh fish all year round. We have to buy frozen ones. This is an opportunity for us to eat some fresh ones,” one customer Marie-Ange Beezadhur tells IPS as she tries to negotiate her way through the crowd. In the lagoon, about 500 metres from the coast, two platforms have been set up, each with four underwater cages. In one average-size cage of four square metres, there are about 5,000 fingerlings, or young fish, which are fed pellets and seaweed collected from the lagoon. It takes eight months for the fish to grow to about 500 grammes, with a small cage producing about four tonnes of fish, and a large one producing about 25 tonnes. To date, aquaculture has been introduced to three areas in the surrounding ocean here, while a further 19 sites have been identified. The cages, nets, fingerlings, and feed have all been provided for free by the government and the European Union (EU) under the Decentralised Cooperation Programme. Marie and the 14 members of this cooperative society catch fish on a line for seven months of the year and for the remaining five months they aquafarm – they were trained to do this by the Albion Fisheries Research Centre. A decade ago, fishers could just throw their nets in the lagoon and catch as many fish as they wanted. But things have changed. “Our catches have now diminished because of industrial pollution. There is also a lack of surveillance of the lagoon and the recklessness of some fishers, who have been catching small fish over a number of years, has put the sustainability of the fish resources at stake,” Marie tells IPS. In February 2012, local fishers complained that an agreement between the EU and Mauritius, which allows European vessels to catch 5,500 tonnes of fish a year for three years, made it difficult for local fishers to earn a living. That year, the production by local small fishers was only 5,100 tonnes and local fishers complained to IPS that because of the EU agreement, their catch had gone down by 50 to 60 percent. The country produces a total of 29,000 tonnes of fish a year. But Minister of Fisheries Nicolas Von Mally met with the fishers at Grand Gaube on Jun. 13 and told them that aquaculture was meant to raise the standard of living of some 2,200 traditional fishers who were finding it difficult to survive because of decreased fish stocks. “We have no intention to fill the lagoon with these floating cages around the island, but only to install a few so that they can produce the maximum amount of fish without polluting or blocking the lagoon,” Von Mally tells IPS. But not everyone is happy with the solution and some fishers and environmentalists say that fish farming will negatively impact the marine ecosystem. “We have observed that many fish and predators, like sharks, roam around the floating cages. They are attracted by the great number of fish in the same place and by the food,” one fisher from Bambous Virieux, in southern Mauritius, tells IPS. Environmental engineer Vassen Kauppaymuthoo agrees.“Too many fish in small spaces means a concentration of fish urine. The fish are fed with pellets that contain antimicrobials and antibiotics. This can harm the marine ecosystem,” he tells IPS. 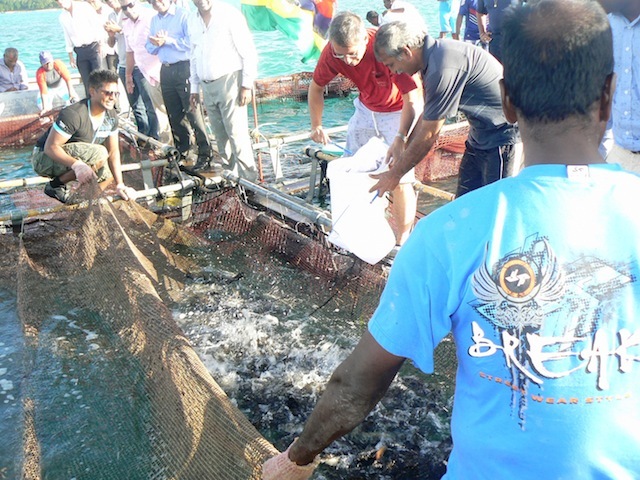 Judex Rampaul, chairman of the Syndicat Des Pêcheurs, an association that defends the rights of fishers, believes that fish farming is similar to the industrial rearing of chickens. “They are different from the fish that live in a natural state in the lagoon. I believe the government is putting too much emphasis on aquaculture. Our fishing space is also reduced in the lagoon,” he tells IPS. 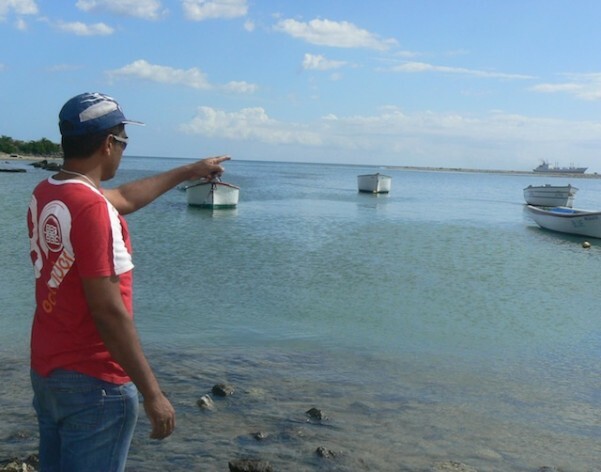 Rampaul and other fishers say that they would prefer for the lagoon not to be used for fish farming. “The idea is also to help protect the lagoon, to let our sea breathe,” Rampaul says. But Von Mally says that aquafarms around the island will benefit fishers and their customers alike. Presently, about 50 percent of the fish that Mauritians consume is imported. “Demand for seafood is increasing and thus pressure on marine resources is rising. In this regard, marine ranching can provide a worthwhile means to sustain marine resources in Mauritius,” he says.